At the gates of the historic walls and a stone's throw from the museum and downtown streets, overlooking a nineteenth-century park with a view of the lower city, the apartment is located in a neoclassical building that belongs to the same family for over a hundred years. he lives in it. Apartment of great atmosphere, recently restored with much taste. Great location to easily reach, even on foot, the most interesting points of the city. The apartment consists of three bedrooms, two doubles and one with two beds, which can be joined together. Two bathrooms with contemporary comfort, a large kitchen with office equipped with oven and dishwasher. A large living room with a fireplace seat and a large dining table. The park belongs to a private property therefore it is not accessible, but is enjoyable from all the windows of the rooms and the living room. The owners will be happy to welcome you and give you advice on places to visit and tell you the history of the building, if you wish. 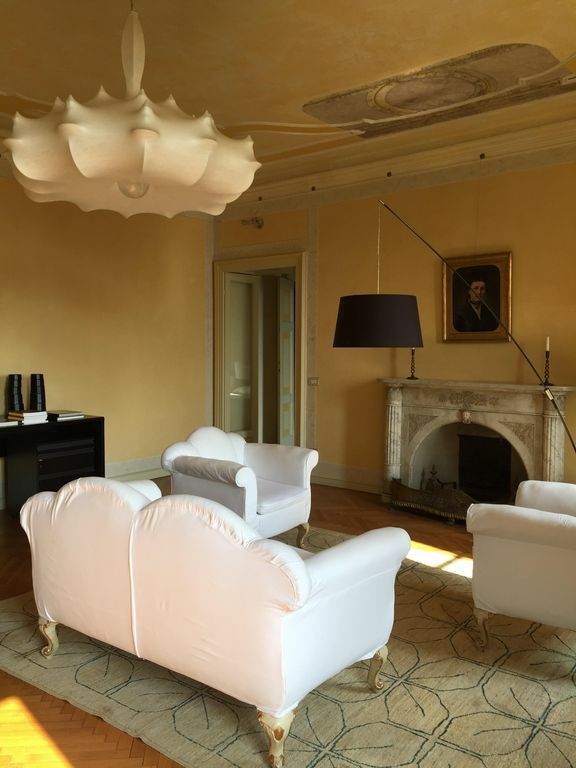 I would HIGHLY recommend the Palazzo Stampa property if you are in Bergamo. It was spacious, clean and it has everything you need. The location is perfect. You are close to the funicular to upper Bergamo city and a short walk to lower Bergamo city. Sveva is the perfect host. Thank you so much for your kind words! I'm so happy to know you spent a good time inour house. Really hope to see you again soon! Best wishes to you all! So glad we chose to stay here! The apartment is spacious and elegant but also warm and comfortable. The hosts have skilfully designed the accommodation so that it maintains its sense of history but also meets modern expectations. It’s truly lovely. Not only that but it is brilliantly located between the upper and lower towns, and on the main bus route from the airport. The hosts are very thoughtful and welcoming. With croissants, milk, water, tea and coffee awaiting your arrival. Spotlessly clean, comfortable beds, excellent quality linen and towels, toiletries provided. You really couldn’t ask for anything more. Other than if it’s alright to return as soon as possible. A terrific find. We can’t rate this apartment highly enough, beautiful decor, spacious with everything you need, extremely helpful host and amazing location ,short walk to the beautiful Citta Alta and right on the bus route to the new town and airport. Great value for money, would highly recommend this apartment for anyone looking to stay in the Bergamo area. Thank you so much Monica! It was such a pleasure to have guests kind like you and your family. Come back soon, we're looking forward to have you again! Magnífica casa, muy cerca de Porta Nova y la Cita Alta, gran atención por parte de Sveva y su familia, totalmente recomendable volveremos seguro, muchas gracias por todo. Muchisimas gracias Francisco, Fue un placer tener amables invitados como usted. ¡Te estamos esperando! Hasta pronto, un cordial saludo.